Merton Heritage & Local Studies service has a small collection of films covering the period from World War II to the present day. These are primarily amateur productions charting the history of local schools, industry and civil defence. Many of our holdings feature the reminiscences of Merton residents and local historians, providing a fascinating insight into the life in the borough over the past century. Merton Heritage and Local Studies Centre tells the story of Merton and its people through a changing programme of exhibitions and events. The Local Studies collection includes a wide range of maps, photographs, directories, genealogical resources, local history publications and corporate records relevant to the Borough and its predecessor authorities. Access: The majority of our film holdings are in formats ( video / 35mm film ) which regrettably cannot be viewed on site. Material digitised through the LSA can be viewed via the project website on public computers located in all Merton Libraries. Although small in size, the Merton film collection represents a valuable resource for anyone interested in the borough's history. Local heritage is more than just words on a page - moving images and reminiscences bring the past to life, humanising it and allowing us to see through the eyes of our ancestors. 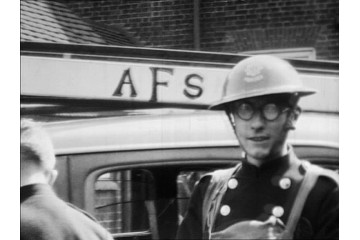 In my opinion one of the most interesting films from the Merton collection features footage of Merton & Morden Auxiliary Fire Service 1939-45. This not only shows the hard work and dedication of those working to protect their community from fire during wartime bombing raids, it also reveals the boredom they faced during lengthy shifts and the humour which helped to sustain them during times of hardship.